“Humans,” the species nobody asked for, “now dominate Earth,” the brutes, “changing it in ways that threaten its ability to sustain us and other species,” for it is our duty to sustain other species. So goes, plus or minus, the opening strains of a melody we have been singing for lo these forty years. Listen to the soothing lyric! “Localized ecological systems are known to shift abruptly and irreversibly from one state to another when they are forced across critical thresholds.” Notice the sly use of forced: some thing is having its naughty way with Nature. What could that thing be? You know. extinction of about half of the species of large-bodied mammals, several species of large birds and reptiles, and a few species of small animals; a significant decrease in local and regional biodiversity as geographic ranges shifted individualistically, which also resulted in novel species assemblages; and a global increase in human biomass and spread of humans to all continents. Now it is a fact that George Bush knew of each of these events, and did nothing to stop them! We’re in luck that our current administration is more caring. Just never mind the positive correlation that the coming of ice and thriving of Man were simultaneous: what matters is the transition killed off picturesque woolly mammoths. Barnosky’s refrain is “past critical transitions occur very quickly”, meaning if they occurred very quickly in the past, they can do so again in the future. Sure, “quickly” is in thousands to millions of years, but why don’t you stop being critical and realize that “Critical transitions lead to state shifts, which abruptly override trends and produce unanticipated biotic effects.” Unanticipated, meaning we know exactly what will happen and it won’t be good. And since we don’t know, we need to “improve biological forecasting” to anticipate “critical transitions” that can emerge; this would “minimize biological surprises that would adversely impact humanity.” This works because forecasts are an apt substitute for actual knowledge. Right, Gav? By God, we don’t even know how many of these feedbacks and synergisms are out there! But they’re there, bet on it. And don’t you know that because we don’t know, you just know that changes in any of them caused by the likes of you, has to change things for the worse? This is why we must “guide the biologic future.” After all, if we don’t, who will? We must keep the Earth as she is, in pristine purity, because however she is now (or was, just before the Industrial Revolution), is how she always was and always must be. Forgot those other tipping points: they’re in the past. The Earth of 1890, or 1850, or whatever, is our goal. Those climates are not in the past. They’re our future, as long as we act now. Otherwise, “the biological resources we take for granted at present may be subject to rapid and unpredictable transformations within a few human generations.” Unpredictable: this is why we must predict them! As our last presidential election taught, change is not always for the better. Indeed, change is always involves “loss”, a word Barnosky loves. Why, if it weren’t for the last glaciation, we wouldn’t even be here to complain about it. Let that sink into your brain pans. Incidentally, the same issue of Nature finds Paul “The End Is Near And This Time I Mean It” Ehrlich wielding his pen in service to the noble goal of “Securing natural capital and expanding equity to rescale civilization”. We’ll look at this tomorrow. Unfortunately, we can’t go back to cave dwelling because that would likely displace the bats which may then become extinct. Yes, gazillions of people is a bad thing so the rest of you: please go away. Paul Ehrlich could perhaps lead by example. Me: I’ll stick around. Somebody’s got to watch the fort. Think of it as my personal sacrifice. Remember, Paul Ehrlich told us in the 1970s that we were all going to die from global cooling in the 1980s? Crop failure and mass starvation as I recall. Lucky for us Mr. Ehrlich called that off at the last moment and deceided we would all die from global warming instead. That would be an even more horrible death than from global cooling. If I recall correctly, fire and brimstone are going to rain down on us, or maybe I got my stories confused. I eagerly await your discussion of Ehrlich’s new misanthropic copremetic sewage. So, what to make of his new predictions of future disaster? I think the answer is now obvious. I agree. That anyone or any journal would still take Ehrlich seriously after an entire career of laughably wrong predictions is a situation that should scare you witless. Of equal accuracy is the interpretation that Ehrlich is indeed witless, aka lost his bloody marbles. Can’t use img src? Here we go. All this is actually a trivial property of non linear dynamical systems what these “ecosystems” undoubtedly are. – Long term unpredictability ? Check. – Sensibility to infinitesimal changes in initial conditions ? Check. – Pseudo randomness which actually is not ? Check. – Creation of complex but unstable spatial structures ? Check. The only stupidity are the “thresholds”. There are no thresholds in such systems. Their states generally wander inside an attractor which may have a very complex and often fractal topology. What is (wrongly) taken for a “shift” is when the system leaves an island of the attractor where the states look similar and wanders to another island of the attractor where the states look very different. What these people ignore, I assume that it must be ignorance, is that such an evolution (besides being unpredictable like William rightly said) will and must NECESSARILY happen because the system quasi periodically vists all parts of the attractor. If it didn’t the attractor would not be an attractor what would be a very unpleasant self contradiction. 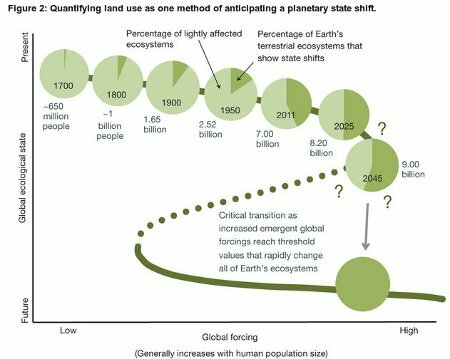 So yes, the future states will necessarily be very different from the present states and this is true both for the climate and for the ecosystems. The next ice age is an example among many. The only unknown is the “when” but this cannot be answered even in principle (see chaotic systems).